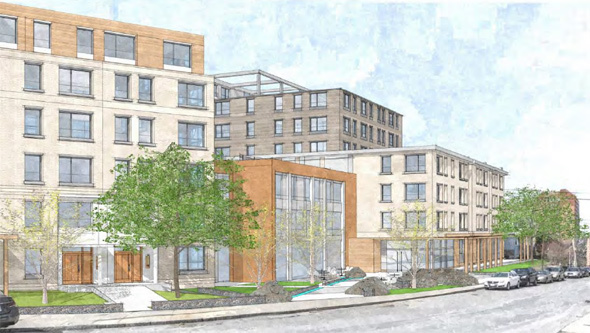 A developer has filed revised plans for the old Radius Hospital site on Townsend Street in Roxbury that now call for 300 apartments and 232 parking spaces. Read more. Rendering by Studio G Architects. Kensington Investment Co. has filed a letter of intent with the BPDA to turn the former Radius hospital complex off Townsend and Harrishof streets into a 322-unit market-rate apartment complex with 217 parking spaces, a cafe and a billiards room. Read more. A teen from Dorchester was ordered held in lieu of $10,000 bail after allegedly flipping the stolen SUV she was driving on Warren Street at Townsend yesterday, sending another teen to the hospital with critical injuries, the Suffolk County District Attorney's office reports. Read more. Around 9:15 p.m. at Townsend Street and Humboldt Avenue. Police found one victim there; the second victim showed up about 1 1/2 miles away in Dorchester.